I got a flat tire yesterday on my commuter bike. My first flat ever. I’ve had tires go low on air, but never popped a tube like that. With 15 minutes to get to work, my options were grab another bike from the fleet or drive. Rather than ride my antique tricycle, Chris’s gigantic fixie, or a sorta busted mountain bike, my best option would be my own road bike. Since it was supposed to snow, though, I didn’t really want to ride a bike that is prone to make me feel wobbly. So I drove. I literally don’t remember the last time I drove to work. (Humble brag. I know. Sorry. Usually I ride my bike or if it’s really nasty out I ride the bus or very rarely walk.) I think it was a year and some change ago, when we were dogsitting a dog who needed to be let out during the day but was too big to fit through our dog door. I didn’t even really know how to do it. Like, I didn’t know the best route via car, didn’t know where to park. (I had to pay $7!) And on my bike, I ride right up to our building. In my car I had to park a block away, then pay the machine, then put the ticket on my car, then walk to my office. I had a hard time in the traffic on my way home, and at one point I could not get into the lane I needed to be in to save my life. Anyways. This is all to say, I love you Ginnie the Schwinnie. Thanks for being my favorite bike. Since I am no longer spending 10-15 hours a week training for triathlons, I suddenly find myself with a lot more time for other things I enjoy. Reading for one thing. And cooking, for another. I ate a lot of Chipotle for lunch over the summer. In part because I was busy and didn’t have as much time to cook, and in part because I was spending a lot of time working out and I was starving all the time and two tacos were just enough food to keep me full for most of the afternoon. The cold weather makes it feel like the perfect time to spend Sunday nights at home, cooking up food for the week. I tried this out last week, and I’m making it again this week. Cook up a whole thing of pasta. Dump in a pre-packaged thing of pesto from the store. 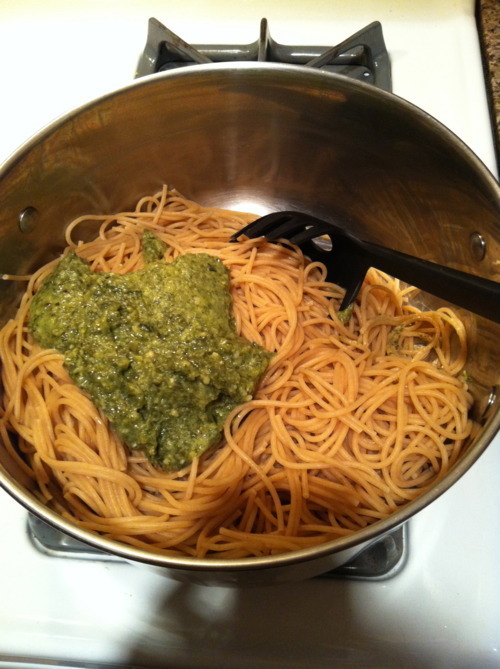 (Last week I made my own walnut-spinach pesto in the food processor. It was vegan, and it was okay, but it wasn’t great. I need more practice, and until then I will be using store-bought which is not vegan.) Mix it all up. This also serves as an impromptu arm workout. While the water heats up for the pasta, pour enough oil in the pan to cover the bottom. (I use a cast iron skillet because I worry about getting enough iron in my diet.) 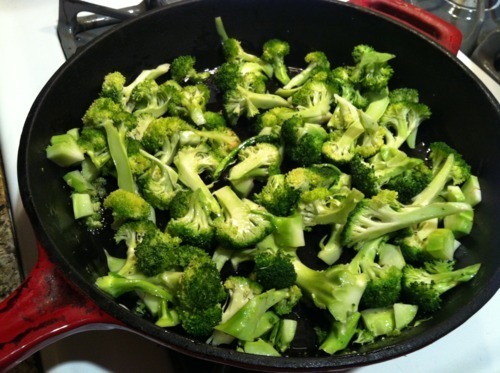 Cook your brocollis until they’re just slightly softer than you like. The thing about cooking for weekday lunches is that you’re going to microwave this for a minute or two, so it can be about 80% as cooked as it needs to be. 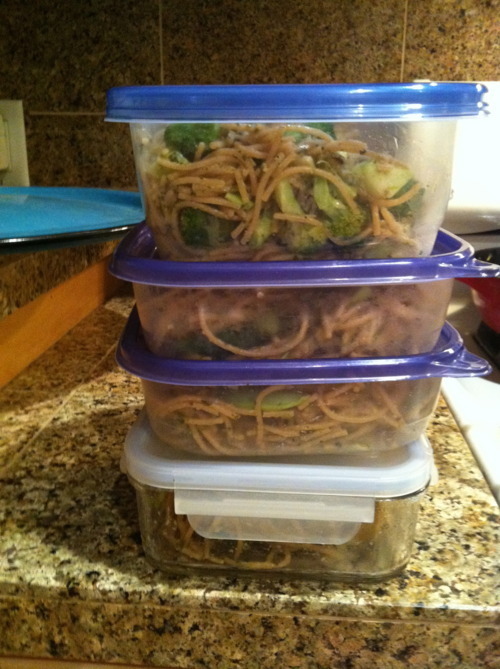 Mix the brocolli with the pasta and put it into whatever hodge podge tupperware you have. It makes about four good sized servings. I microwave this for about 90 seconds at work. With my yucky homemade pesto last week, I added a splash of water to the container before nuking it to add some needed moisture, but I don’t think that will be necessary with the pre-made pesto, since it’s a lot more oily. This recipe accounts for the fact that you’re going to take a few big bites of pasta once it’s cooked. And a few big bites of the final product before tupperware-ing it. How much wine you drink while cooking is optional. Welcome back, Mountain Standard Time! Yay! 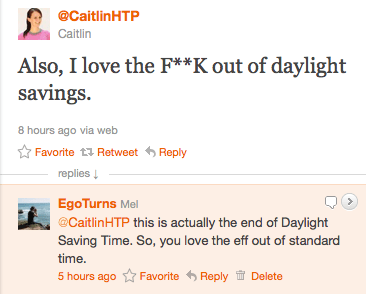 It’s the time of year that my gigantic wall clock gets to go back to being correct. 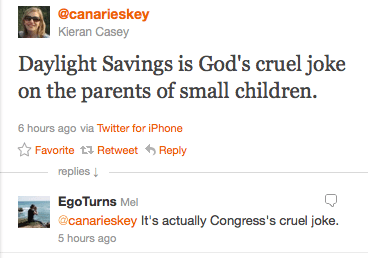 I celebrated by harassing people on twitter. I wish I’d gotten to use this awesome idea of waiting to move the clocks back until Sunday night, because what better way to beat the Sunday night blues? But my first “appointment” of the day was at 8:30, meeting up with 3 friends for our tiny running club. I was a little worried someone would show up at my house at 7:30, but I also knew every had iPhones (that would update automatically) and I pyschically predicted that everyone would be about five minutes later rather than an hour early. Sadly, I had to bail after one mile. I’ve been fighting off a cold all week, and I had a pounding headache ten minutes in. I did feel well enough to join the post-run breakfast at Spices. Target run. Making lunches for the week. This is what Sundays are made of. 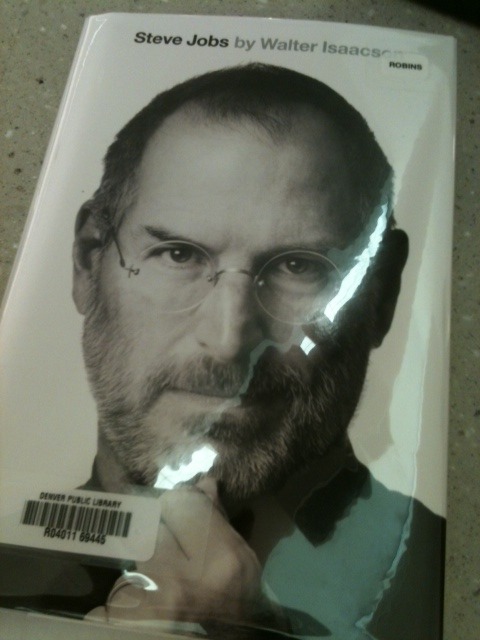 Guess who has library hookups and was number 9 on the hold list this for this guy? I’ve been looking forward to it so much I’m almost sad to read it because then I will finish it and it will be over. But I have about 600 pages to go, so it should last me a while. This will be book 22 in my 25 in 2011 challenge, and a rather bold move, if I do say so myself, to choose a 656 page volume with only two months left to read three more books after this, but I suppose I’m counting on Thanksgiving and Christmas break to give me some extra time. It snowed again! And I biked again. But this time I remembered to put on a frigging scarf. And to tuck in my hair. 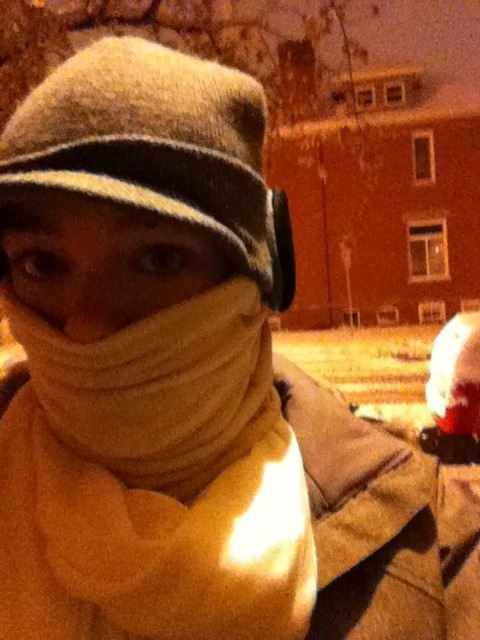 It was a lot slushier on the road, and I wobbled once or twice, but I went slowly and I made it safely to work. You know what wakes you up better than coffee? Nineteen degrees plus almost crashing your bike once or twice. 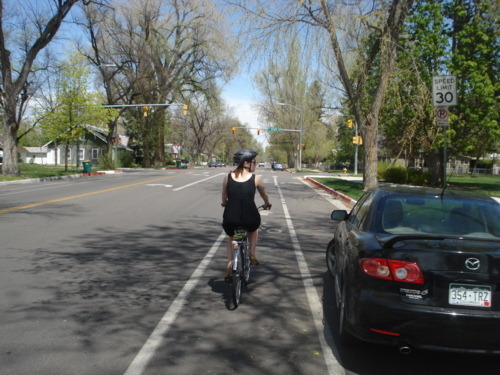 I only saw one other cyclist on my ride, and I offered him a fist-pump-of-solidarity. I may wimp out tomorrow, though, because all this meltyness is going to refreeze tonight. Snow I can do, no problem. Ice? Whole ‘nother story.